Pros: An original play with a largely female cast. Good use of props and set pieces to create the multiple locations of the play as well as nice use of puppetry. Cons: The issue of feminism wasn’t really explored despite the gender swap of the lead characters. It felt like the script could have done with an edit to make it more succinct as was a little meandering in places. 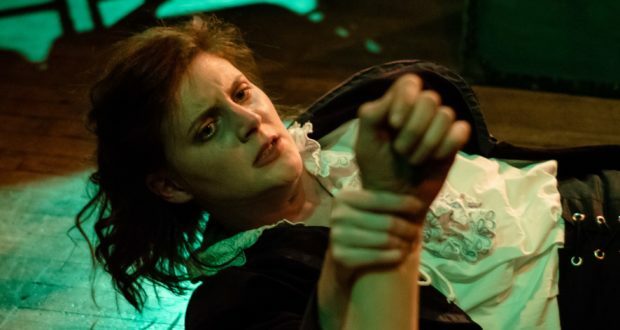 Burn-Bright’s production of Frankenstein replaces the male scientist from Mary Shelly’s Frankenstein, but the story didn’t really explore feminist issues as billed. The gender swap seemed a bit incidental to the story – I thought maybe this was a difficult text to try to interpret with a feminist narrative. It was pleasing, however, to see that so many women had been involved in the creation of the play with the writer, director and the majority of ensemble cast made up largely of women, with the exception of Carlton Venn who played Henry Clerval. The Old Red Lion is quite a small theatre space, and the cast made good use of a limited number of props to represent the multiple locations of the play. For example, a white sheet was used to great effect as an operating table, a crib, clothing, and the mast of a ship, whilst an old suitcase was the door to a home, a prison cell, and the dock in a court. Five actors played all of the roles from the novel with impressive use of a puppet to play poor unfortunate William. The cast tackled the multiple roles well, but it got a little confusing as to who was who on occasion; some different costume pieces could have helped to differentiate the characters. 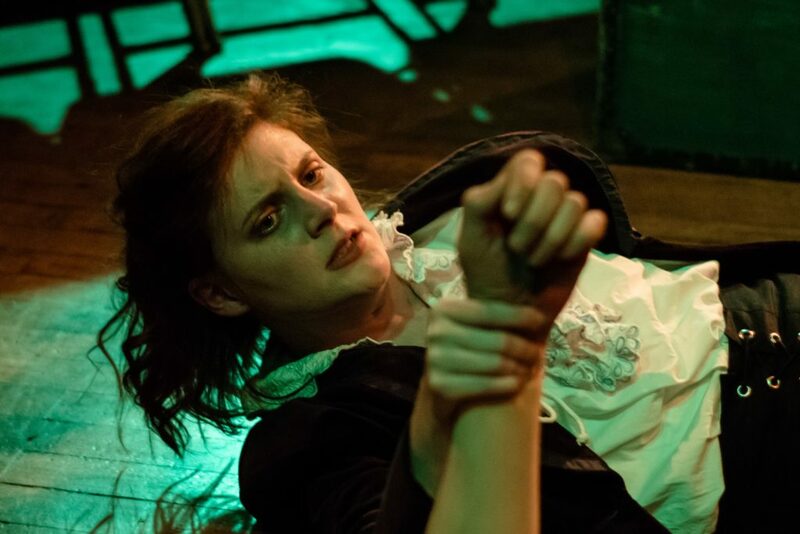 Good use was made of lighting, sound and physical theatre to create the spooky oppressive atmosphere of Mary Shelley’s novel. But there was too much emphasis on the use of shrieking to convey fear. To my mind it could have done with having some more nuanced and layered expressions of emotion. The writer stuck faithfully to the novel, but it felt a bit cramped trying to get it all into an hour and a half performance. It could have done with editing out a few scenes, such as the visit to the family in the wood, which didn’t really add anything that the murder of William wouldn’t have done. Overall a solid production though, and impressively performed in a tiny space on a small budget. The play is ended now but worth visiting their website checking out future performances of Burn Bright Theatre. Running until: The production has finished it’s run.